« I miss Cambridge sometimes. I read a bunch of food blogs. When Food Gawker featured this Applesauce Bread, my boyfriend wanted it. I made it. It didn’t seem spectacular– no fireworks or anything. But as it sat in the kitchen, it got munched on, and munched on, and by the time we were clearing up the kitchen to go to sleep, there was only a slice left. I made it again. 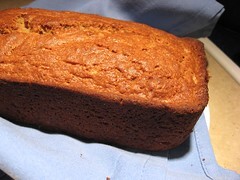 This time, however, I was distracted, and I ignored the timer going, because I had set it a bit early, and I would just get it after chopping the onion….. Fifteen or twenty minutes later, I swore, grabbed a potholder, and rushed the quick bread out of the oven and out of its pan. I was convinced it would be dry and horrible– but it wasn’t. The applesauce kept it moist inside, and the extra time gave the outside a bit more… crustiness. It has now been requested that I overcook it all the time. Only, now I’m out of applesauce! I’m still not exactly sure why it’s so good, but it still disappears remarkably fast. Recipe from Back to the Cutting Board’s Family, with only one real change by me. Preheat oven to 350 degrees (F). Grease a 9×6×3-inch loaf pan. Pour into pan. Bake for about 1 hour. (Or a little more if you want it crispier.) It’ll be a nice golden brown and a toothpick will come out clean. Cool 10 minutes and remove from pan. I’ll probably also try her Glazed Lemon Cakes when I remember to buy a lemon!